Gosh that would be awesome. Though I do wonder if they will end up including all the field elements, like jumping pits and throwing circles and all that. 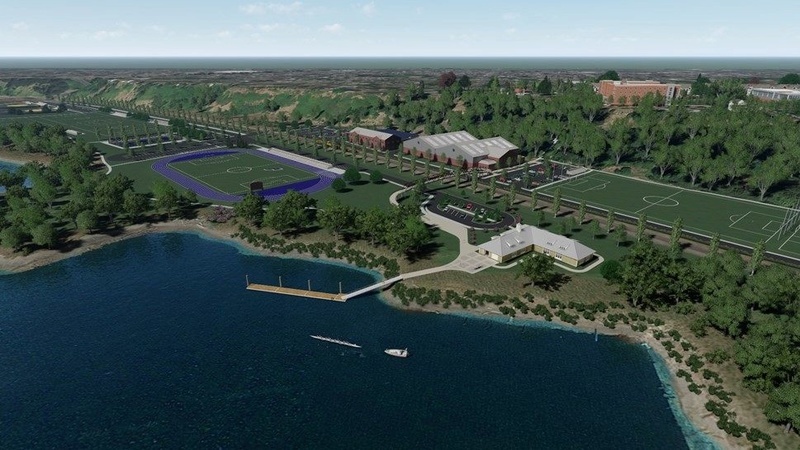 And look in the background for the new Physical Plant building (which just got a $10 million gift for its relocation), the new tennis center, the boathouse/dock, and the two practice fields. Makes me drool!!! Just going by these plans, apparently there is no planned foot bridge over the railroad tracks that split the River Campus. 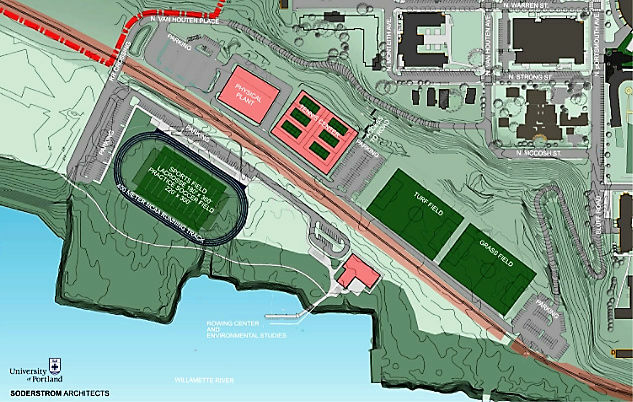 DoubleDipper wrote: Just going by these plans, apparently there is no planned foot bridge over the railroad tracks that split the River Campus. Yeah, I was wondering about that too. I think (don't quote me on this) that they are still working out with the railroad if a footbridge is doable. If they added all of the appropriate field elements to the track then we could possibly host a big meet, which would be awesome exposure. 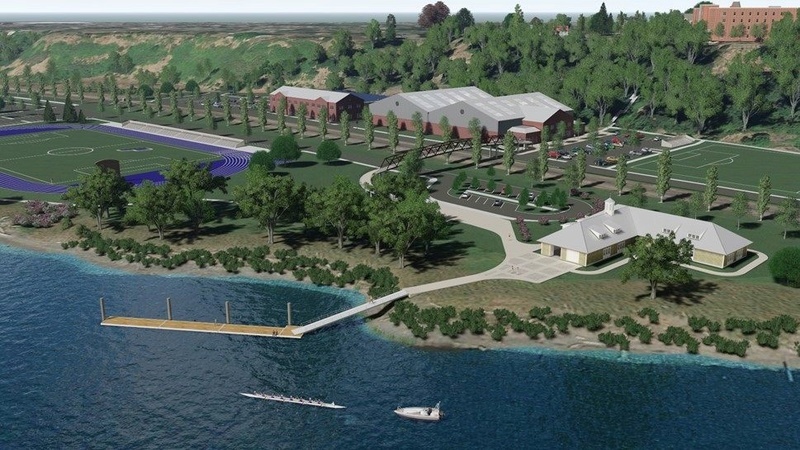 If you look at Stonehouse's image, there is a bridge over the tracks leading to the boathouse, just southeast of the new tennis center. Do we know the timing of any of this? It looks fantastic... a long time coming! Oh yeah...looks like a vehicle bridge. Just wonder if it's in the actual plans.... Could add quite a bit of cost that might be better spent, but it would seem there'd have to be some sort safety features associated with the track(s). Is a foot bridge really necessary? Those tracks don't get a ton of rail traffic. They pretty much only get used by the Toyota dock south of Cathedral Park. The tracks go right through Cathedral Park and it never seems to be a problem. The tracks may be at grade and unused, but with athletic facilities there, I think some sort of over/underpass is necessary. If some sort of emergency happens on one side of the tracks with a train going by you wouldn’t want first responders sitting and waiting while the train passes. Those minutes are valuable. This is the unlikely extreme but is very real life for some residents in small towns along the Gorge. PilotNut wrote: Do we know the timing of any of this? It looks fantastic... a long time coming! I know they are hoping to get working on the two soccer fields (one grass, one turf) ASAP. But there is still some wrangling that needs to happen with the city and permits. I think there was hope they might be able to start in this fall, but it might get delayed until spring when the weather improves. They are only allowed to work in the water for a specific period of time (something like May-August) for environmental reasons, and I know they are hoping to use all that time in 2018. There's a lot of work that needs to be done - removing all the old docks (dolphins, I guess, to be more specific) and old pilings, and then building the dock for the boathouse. As for the physical plant, track, and tennis center... not sure on the timeframe for those. The physical plant did just get a major gift ($10 million), so that will certainly help. 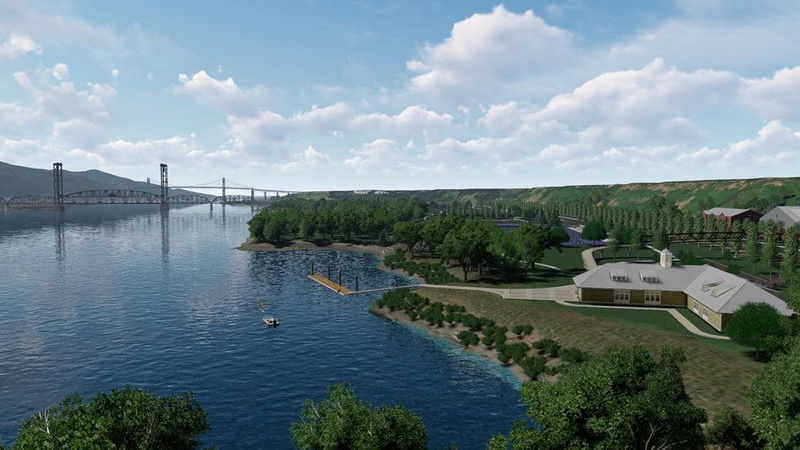 I believe there is another very significant gift that is at least in part earmarked for the River Campus... if and when that is announced that might give some clarity on the timeframe for everything. 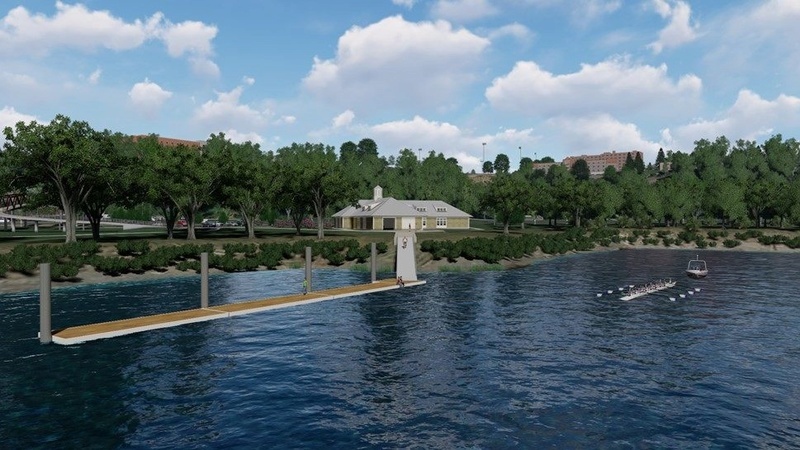 I was just shown another rendering that clearly shows it is a footbridge leading to the boat house/rowing center over single set of tracks. 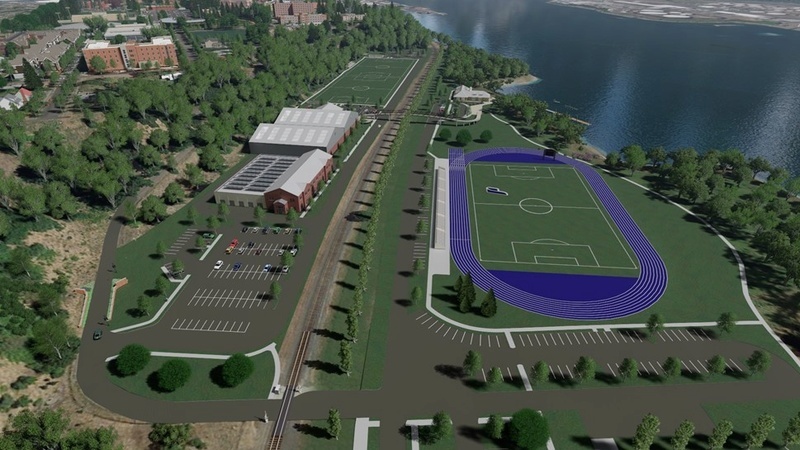 Also in the rendering is a level crossing of the tracks for vehicles located at the north end of the River Campus. 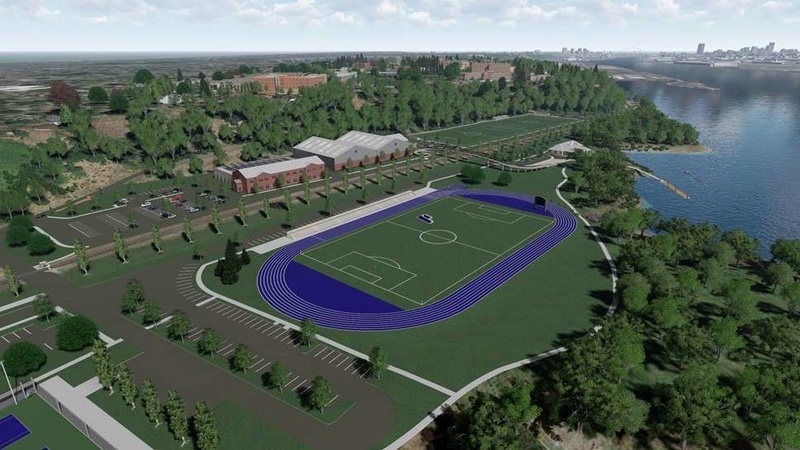 UP Vice-president for Operations Jim Ravelli surmised the two soccer fields and tennis center "will happen" in 2018-19. My guess is the running track will be last. I was on the River Campus last week, and the only thing there that looks recently built is the parking lot at the north end. Of course the running track will be last. Track and field is always last at UP. Haven't had a track in place since 1984. It's really quite shameful. Love it. What's with the soccer field in the middle? Getting a track would actually be pretty huge for us relative to the conference. 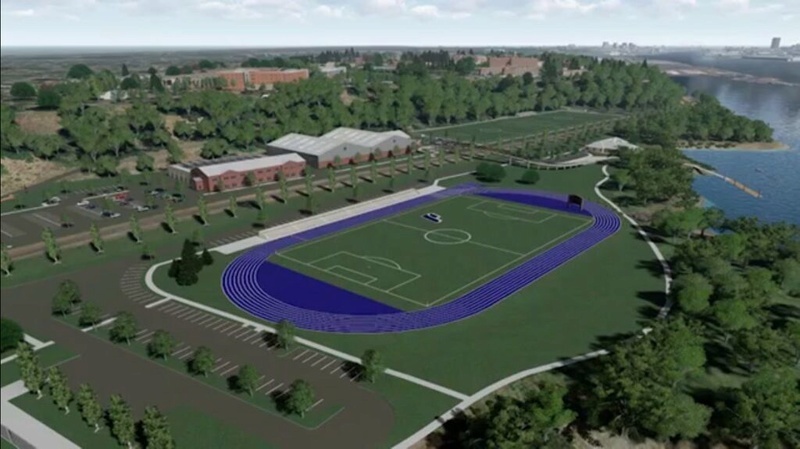 BYU is the only school with a full-sized track facility. Pepperdine has some sort of four lane track that their soccer team plays inside of. But, that’s it. What’s interesting to me is that every WCC school competes in track but we don’t have it sponsored as a WCC sport. More WCC schools have track teams than golf or softball teams. Maybe the facility issue is why. Seems like it would require a whole lot of effort to instate a conference track and field championship. Initial work has already begun with improvements to the infrastructure and preparations to the property, which the Franz gift will help support. 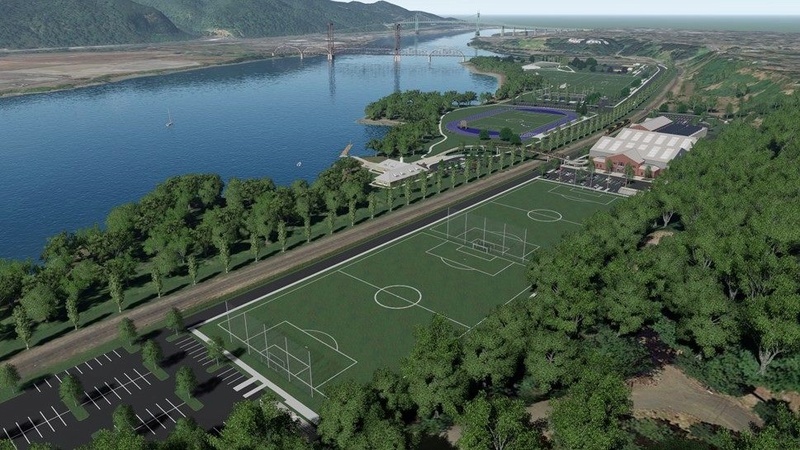 Eventually, the Franz Campus will be home to two additional soccer practice and intramural lighted fields, a tennis center, a track and field facility, an environmental research space for hands-on application of the science curriculum, a rowing center and dock, a new physical plant building, and additional campus parking. A few more renderings below... in particular note the one that also includes a rendering of the adjacent McCormick and Baxter property, with what looks like softball fields, a few more soccer fields, and an amphitheater. Gosh it would be awesome if UP one day got control of that property and was able to develop it like that! Further note... I'm also pretty excited about what UP might be able to do with the land the tennis center currently sits on once it moves down to the Franz Campus. The land that the current L.P. Tennis Center sits on is prime...if some of the vegetation behind it was trimmed, there would be a great view of the river. Does anyone know about the building that currently houses the Physical Plant? That is steep land to try to do much with, but I recall something about lab space? Construction starting in March?! It's already March! I agree that the tennis center is prime real estate. I heard that the tennis building itself is somewhat portable (?). So, it could just be deconstructed and re-assembled down on the river. Is there any truth to that? There are no (current) plans for UP to develop the McCormick and Baxter property that was once a creosote plant, and even after years of EPA cleanup still has "hot spots." Issues of liability and cost are factors in any future decision to develop the land, but it could be a nice area to include in a X-C course for fleet-footed runners, something that could solidify UP's X-C status in the US. The tennis courts will NOT be moved to the Franz campus, the six courts there will be brand new and will includes scoreboards and seating for spectators. The new facility will make UP eligible to host the WCC Tennis Tournament. The space where the tennis center now sits is currently designated to be a plaza where people can lounge to enjoy the views of the river and hills to the west. Earlier renderings showed the wonderful view over this new plaza from Shiley Hall to the river below. The space where the physical plant currently sits will most likely become an innovation laboratory that will be a great additional resource for the engineering department, and combined with the new environmental lab that will be part of the rowing center, will add a great deal to the research that goes on at UP. DoubleDipper wrote: The space where the tennis center now sits is currently designated to be a plaza where people can lounge to enjoy the views of the river and hills to the west. Earlier renderings showed the wonderful view over this new plaza from Shiley Hall to the river below. That would be fantastic! I'm a big proponent of the power of "placemaking"... done right, that space could become a real gathering spot and point of pride for the campus. Would be neat opportunity to add some more public art to campus as well. All the legalize in this article made me take a few more sips of beer to finish it last night, but apparently trail enthusiasts need a 14-16 foot wide trail through the Franz Campus to make their lives happier, and UP has agreed to only 8 feet. Maybe you can get the trail people to put up a parking garage in exchange for a trail wide enough to support their needs.
. . . who is obligated to give up land for the trail . . .
As for what’s required by land-use law, it appears that U of P has no legal requirement to build the trail. Hey, if you want to confiscate private property, pay for it. DoubleDipper wrote: All the legalize in this article made me take a few more sips of beer to finish it last night, but apparently trail enthusiasts need a 14-16 foot wide trail through the Franz Campus to make their lives happier, and UP has agreed to only 8 feet. The University has been involved in planning meetings for NP Greenway for many years, and has been a willing participant that supports the vision - so much so that the University is willing to provide land *and* pay for construction of a trail. That being said, it's a bit hard for me to understand why this article is so negative towards the University... why aren't they directing their ire toward Union Pacific railroad? I'm 100% in favor of making the NP Greenway a reality, but it's frustrating that advocates of it are treating a willing partner like the University so harshly. Especially considering UP has spent millions rehabilitating a huge piece of formerly polluted industrial property. Would they prefer the old creosote plant and no trail at all? I live near the Springwater Trail. It has become a serious problem, due to the number homeless campers using that right of way. Last year, the Hood To Coast runners ran in the streets rather than run on the trail at night. Perhaps UP would be wise to go slow on the NPG trail. pilotram wrote: Love it. What's with the soccer field in the middle? Follow up on this... I heard that the plan *is* to include full field facilities with jumping pits, throwing circles, etc. 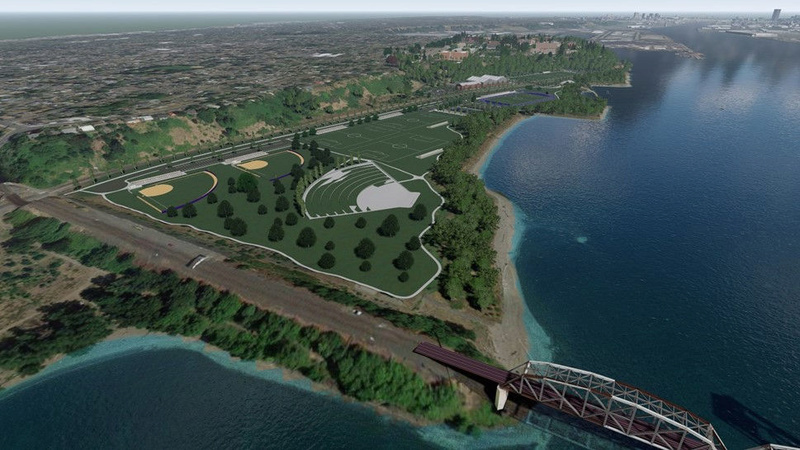 The renderings just don't show that.